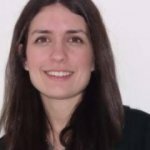 In this blog, Beatriz Goulao, a research fellow at the University of Aberdeen, shares news of the latest evidence on routine scale and polish and dental check-ups, and reflects on the more complicated story that emerges when finding out what people value. I had my first scale and polish when I was 26. Having moved to Scotland to start a new job, I signed up for the dentist and she recommended I should return every six months for a dental check-up and a scale and polish. Back in Portugal, where I grew up, the idea of preventive dentistry did not appeal to me. To my surprise, a scale and polish gave me a funny, yet satisfying cleanliness feeling. It made me more excited about scheduling appointments every six months! If I am being honest, I actually did not know why I was getting a scale and polish and I am embarrassed to say I did not question it. I trusted the recommendation from my health care professional, and the fantastic feeling after! Soon after starting my new job as a statistician at the Health Services Research Unit in Aberdeen I started working with dentists in randomised controlled trials in primary care dentistry in the United Kingdom. They taught me that scale and polishes and education were used as the main strategies to prevent gum disease in the National Health Service (NHS). But I also learnt there was actually no strong evidence behind either recommendation. The first trial I ever worked on was called IQuaD – Improving the Quality of Dentistry. IQuaD was a ground-breaking trial: it was testing whether 6-monthly scale and polish improved gums’ health compared with yearly scale and polish or none over three years on regular attenders to the dentist with healthy gums. To my surprise as a dental patient, this was the largest trial ever to test this question. Even though this was such an engrained health behaviour in the UK and worldwide [1,2], there was actually no evidence behind the idea that a scale and polish every six months helps keep your gums healthy. The pleasure from my scale and polish might be meaningless from a health perspective? What a disappointment! How do we measure gum health? First things first, especially as a statistician: how do we measure people’s gums’ health? We collected data on bleeding on probing, calculus (tartar) and pocket depth as indicators of your gums’ health. Initially I was surprised about this. I thought bleeding gums were just a result of brushing teeth too hard. I did not realise they were indicative of gum inflammation and could lead to more serious disease and even tooth loss. This is the thing about gum disease: it is silent and it can secretly deteriorate until it is found. IQuaD also tested whether personalised oral hygiene advice improved gums’ health or patients’ self-confidence in their ability to brush or floss compared with routine advice (both given by the dentist or hygienist). The results are now out  and so is the Cochrane Review  that includes them. To summarise IQuaD: there is no evidence of a difference in bleeding between 6-monthly, 12-monthly or no scale and polish over three years in healthy adults that attend NHS dentists in the UK. The differences found were very small and we were confident they excluded the possibility of a clinically meaningful difference between the groups. The same was observed for personalised versus routine advice in bleeding and self-confidence on the ability to brush and floss. The Cochrane Review supports these findings. 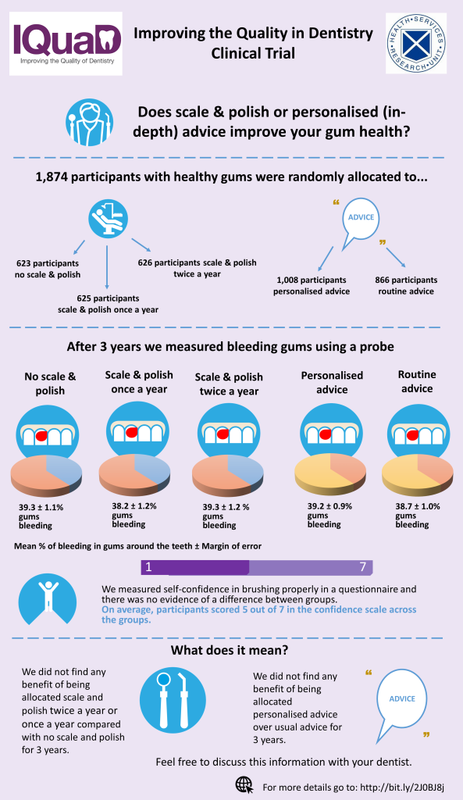 We prepared an infographic (below) to disseminate the results to trial participants and dentists with the support from the public and patient’s involvement group at the Health Services Research Unit . The group’s main concern when introducing these results to the public was clear: scale and polish might not improve your gum health, but we should make it clear that patients still need to go back and get check-ups done. Should we? I have always heard that you should go back to the dentist for a check-up every six months. This is routine practice in many countries, including the United Kingdom. It has been a cornerstone of dental practice since mentioned by Pierre Fauchard in 1746 , but a lot of experts have questioned the evidence for it. The most recent Cochrane Review about dental check-ups was published in 2013 and concluded there was very low-quality evidence from one randomised controlled trial, which was deemed insufficient to draw conclusions regarding the potential benefits of changing the recall interval between dental check-ups . We are currently analysing the largest study ever on this (INTERVAL) to find out the answer: do 6-monthly check-ups improve your gums’ health, or caries prevalence compared with risk-based or every two years check-ups? As before, we measured gums’ health indicators like bleeding and calculus (tartar). Caries were considered as a secondary outcome. The INTERVAL study results will be available towards the end of 2019. We were not just interested in the clinical effectiveness of scale and polish; we also looked at how much people valued the treatment and why. We conducted a survey asking people’s preferences and willingness to pay for different dental packages. The work, led by Dr Dwayne Boyers, is described in IQuaD’s monograph . A brief summary is: the general population value scale and polish and personalised education. 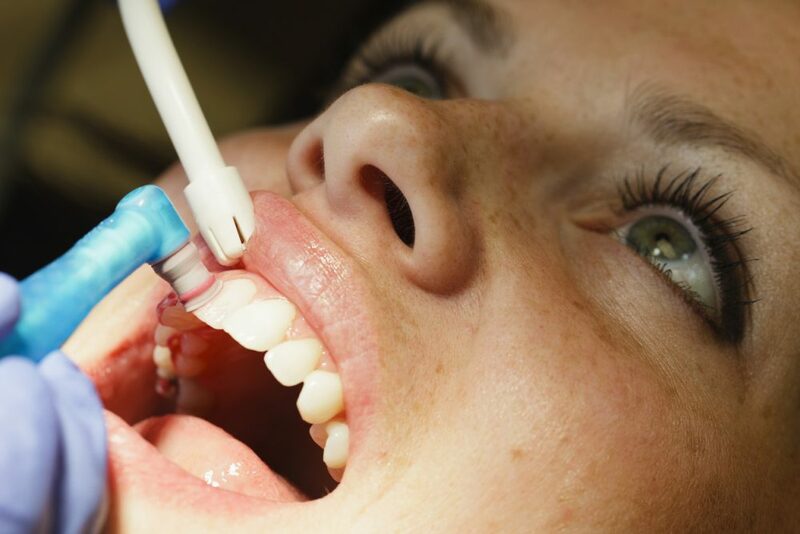 Responders to the survey showed a willingness to pay more per year to have their teeth look and feel very clean (compared with look and feel very unclean) than their willingness to pay to never have bleeding gums (compared with having bleeding gums very often). This shows the general population attaches a greater value to shifts in their aesthetic outcomes compared to changes in bleeding gums. The results can lead to a more complicated story. If people feel better after having a scale and polish and it contributes to their confidence and their appearance, should we be including it as part of the NHS even though it does not improve gum health? Unfortunately, many treatments provided in primary care dentistry have been based in anecdotes and weak evidence. With IQuaD, INTERVAL and Cochrane Reviews on topics such as scale and polish and dental check-ups, we hope to change that and contribute to an evidence-base practice of dentistry. We need good quality evidence to support the treatment we get in our dental practices and how the NHS funds are spent. More research is needed on how to prevent gum disease: even though its cornerstones (scale and polish and oral hygiene advice) have been questioned, there is still a lot to be done. Different types of education or targeting specific groups could lead to different conclusions. Join in the conversation on Twitter with @beagoulao @CochraneOHG @CochraneUK or leave a comment on the blog. IQuaD and INTERVAL were funded by the NIHR Health Technology Assessment (HTA) programme. The views expressed are those of the author(s) and not necessarily those of the NHS, the NIHR or the Department of Health. Beatriz Goulao has nothing to disclose. Page last updated 08 April 2019. It is a disservice to the public to publish this article. It has a lack of complete information. Statistically the the study needs to include gender, age, teeth where bleeding was noted, patients oral hygiene or lack of oral hygiene and geographic dog where study to place . . To simply say regular dental visits may be unnecessary is strongly misleading. Preventive dental visits is more than scaling and polishing, it also includes radiographs to examine for other dental diseases like caries and oral cancers. So to sum up these dental appointments are not necessary is simple terrible advise and your study a waste of time. How can providing robust evidence in a digestible format be a disservice to the public? Also, if you had just clicked the references available at the bottom of the study you would have seen that results moderating for age, gender, baseline bleeding etc were all included. The point where you say “To simply say regular dental visits may be unnecessary is strongly misleading” is not true, the author simply writes that those results will be available this year. Finally, you are in the minority of you believe a robust RCT is a waste of time, I as a user want to know whether my money for my scale and polish is improving my dental health. All too often the people commenting on these things are people who do not actually bother to read all the documents provided and then complain that the blog author hasn’t done ALL the work for them. A ridiculous complaint. Perhaps starting with people with healthy gums is excluding the group that really benefits, people who are prone to gum disease.